When Studio 904 first opened, I envisioned an entirely new type of salon. I wanted not just to please our clients but to exceed their expectations. I knew this would require a complete rethinking of the whole salon experience. To achieve this goal, I first created an innovative workplace for stylists, providing high quality, hands-on training and progressive salaries with benefits. Together with my team of employees, we have nurtured a company culture grounded in honesty, fairness, excellence and teamwork. While our primary goal is to indulge clients with first-class hair care and pampering services, we are ultimately devoted to making a difference in people’s lives-the lives of our clients, our employees, and of the people in the communities we serve. We have made community outreach a priority, and have incorporated community service from cut-a-thons to back-to-school benefits into everything we do. Through our “Your Looking Good” program, we gave haircuts to hundreds of disadvantaged children in our neighborhood. Inspired early in my career by Kaizen, the Japanese word for “life-long learning”, I have applied its philosophy of continuous improvement to guide Studio 904 since its inception in 1987. To ensure that our clients always look their personal best every time they leave our salon, I work one-on-one with every Studio 904 stylist, providing instruction in the art and technique of hair design as well as effective communication and personal skills development. Our innovative workplace philosophy has been recognized in the media, both locally and nationally, in such magazines as Self, DaySpa and Working Mother. The Studio 904 team has received many prestigious national awards, such as the Better Business Bureau’s International Torch Award and the Minority Entrepreneur of the Year Award. Our in-house training program was one of the first certified by the State of Washington. I believe the fundamental choices we have made make all the difference in bringing you unsurpassed service, and we look forward to exceeding your expectations in new ways. 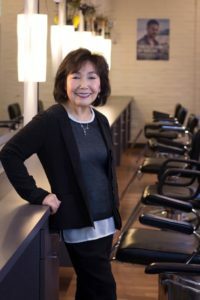 Kay Hirai is a seasoned hair stylist, salon owner, author and a professional speaker. Thanks to her unique training approach, which combines self-esteem building with personal skills development, she has become known nationally for her inspirational keynotes and motivational workshops that participants call “life-changing”. Kay’s presentations include: “Branding Your Uniqueness” and “The Best Workplace Practices.” She is also the author of Sheer Determination, the story of her Salon’s success, a memoir, “Keiko’s Journey,” and the book “Yumi’s Life Lessons”, based on the lessons she learned from an unlikely teacher, her Jack Russell terrier, Yumi.